– scouring eBay for a new piece that someone else has just identified… and actually snagging one! Admittedly, it’s fairly easy to have a damper put on these moments – if you can’t find what you’re looking for on eBay, for instance – but the biggest cause stems from the fact that in many cases, you have no idea what you’re actually looking for. The culprit? The filters in the Twilight films. I’m looking at you, Catherine Hardwicke, for setting that precedent. Take the piece that was identified on Coolspotters this week for example. In Twilight, Alice wore a Coco short sleeve blazer by BCBG Max Azria. She wore it for approximately three seconds, mind you, but she did wear it, paired with a Guess short sleeve babydoll shirt. This blazer is available in seemingly every colour under the sun – ash, moss green, plumberry and jade – but based upon that screencap, it looks as though ash is the correct colour. And the truly good news is that the blazer is available on eBay in a multitude of sizes and colours – for an affordable price. But nothing is ever that easy: a challenger appeared in the form of a wardrobe test shot, wherein Ashley is clearly wearing the moss green version of the blazer. – In the Twilight Director’s Guide, there are two pictures of this blazer in wardobe tests, and it’s green in both pictures. – Alice has never worn another brown piece. – When the blue filter is neutralized in Photoshop, the blazer appears brown. – If a blue filter had been put over the green top, it would appear teal, not brown. And so the question must be asked: which version is Alice actually wearing in the film, and what else is that blue filter hiding? What was meant to be a stylistic and atmospheric choice has yet again become the bane of Alice costumers everywhere. Case in point: Alice’s Rebecca Taylor dress, although it appears purple in New Moon, is actually blue. 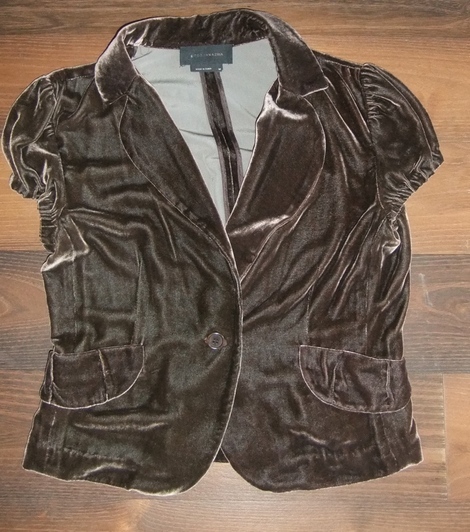 And the Zara star buttoned waistcoat, although it looks black in New Moon, is actually gray. Come to think of it, so is Alice’s H&M vest in Twilight, although it looks navy blue. So let’s hear it, Alice fans: is she wearing the green or the ash BCBG Coco blazer? Are there any other costume pieces you’re questioning the colour or authenticity of due to dark lighting or coloured filters? Let us know! Next Did anyone see this coming?